While the essential components of Pizer's story are authentic, more of the details of his life have been altered for the novel than any other character. The most obvious of these is "Pizer's Boots" - the boot maker's store on Whitechapel Road, which also serves as Pizer's home (and a temporary stop for Edward and Toby on their first night in Whitechapel.) 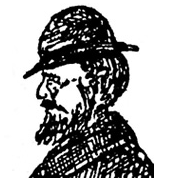 In truth, no such place existed as, by all accounts, John Pizer appears to have been out of work during the Autumn of Terror and most likely would have worked from a room in his home, rather than a shop. Pizer's residence was also slightly farther away from Whitechapel Road than 1888 suggests. In reality, Pizer lived on Mulberry Street, just off Whitechapel Road. The reason for this change was simply for geographic simplicity. In order for Toby, Edward and Pizer to meet on the first morning of the story, Pizer's Boots would need to be close to both Whitechapel Road and the House on Osborn Street. By including Pizer in 1888, I wanted to tell a far broader story of anti-Semitism in Victorian London. Aside from Whitechapel's prostitutes, it is hard to imagine any group of people having a worse Autumn than London's Jews. In the decades proceeding 1888, immigration from eastern Europe was at an all time high, and many of the native born Londoners looked upon this wave of mostly Jewish newcomers with a mixture of fear and anger. It is no surprise that as soon as accusations of a murderer living in the East End were made, the Jewish people of London had the most to fear from reprisals. Ripperologists may find the most egregious instance of my use of historical revisionism, in the form of something I overlooked, as opposed to a complete fabrication. It is known that Pizer was charged with a stabbing offence several years prior, and several prostitutes named him as a menace and a violent thug. It is hard to ascertain details about the stabbing offence, but it doesn't appear that he served any time in prison for this crime, and while the suggestions of him intimidating prostitutes may be alarming, this seems as likely to have been a media exaggeration on behalf of the papers of the time, eager to find more dirt on their favourite, Jewish suspect. The attention to detail I have paid to this book is why I wanted to begin by pointing out the most obvious examples of where I have twisted the truth for the sake of plot. John Pizer may well have been a far less sympathetic character in reality than he is portrayed in the novel, but there are also very good reasons for doubting that he was quite the monster the press had made him out to be. In the end, the ballad of John Pizer is a redemption story. Through losing everything, Pizer reassesses his opinion of London's prostitutes and begins to empathise with their plights, and while this somewhat simplistic interpretation of the facts may at first appear to be little more than imagination on my part, I believe that the heart of the story is authentic, with a few half truths for decoration. For this, I hope my honesty will go some way towards being forgiven by the most ardent of Ripperologists!